I received a huge pile of lovely batts for my birthday, custom-blended by the incomparable Ever Improving Me. I admit to having been lazy--I didn't photograph them. But I've spent a lot of time spinning them, and one of the batts just seemed perfect for Percy. 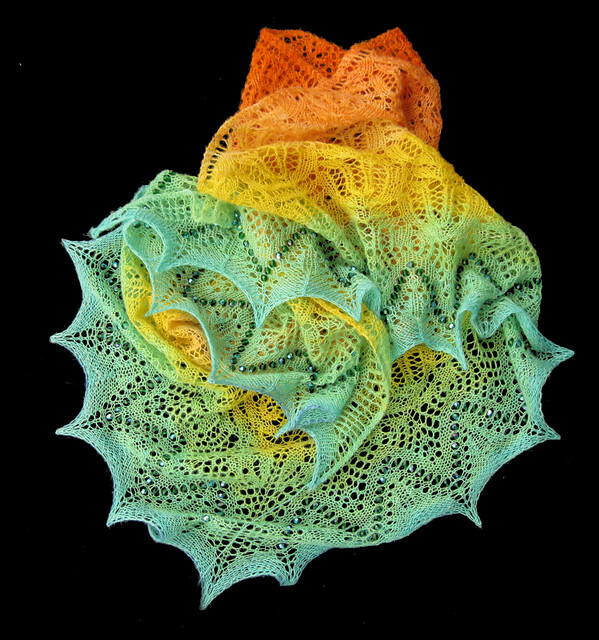 The pattern is, unbelievably, free, and a fantastic knit--interesting, non-repetitive, and adapts easily to any length. 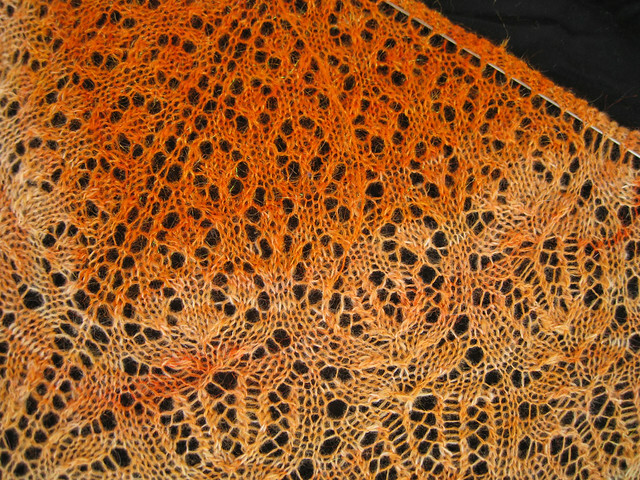 I wanted the top of the shawl to be a bit darker in tone than the rest, so I snitched some orange fiber from another one of EIP's birthday batts and spun it up first. 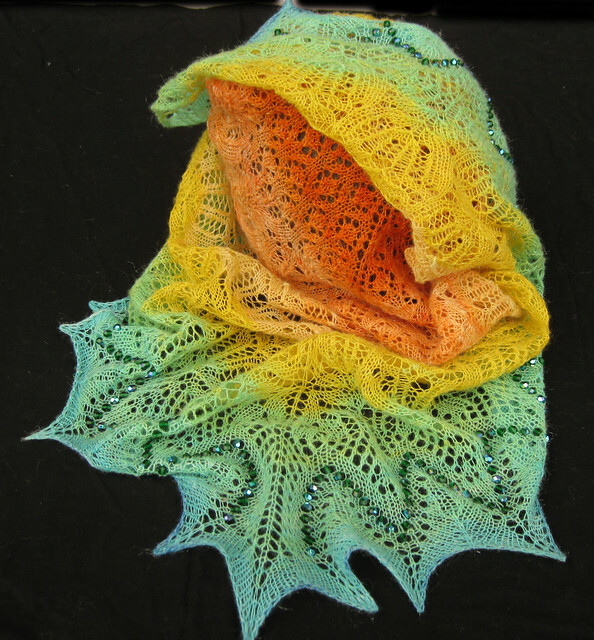 The yarn, a two-ply spun on Tibetan spindles, is merino with lots of lovely, sparkly angelina and firestar, which makes the shawl twinkle happily. 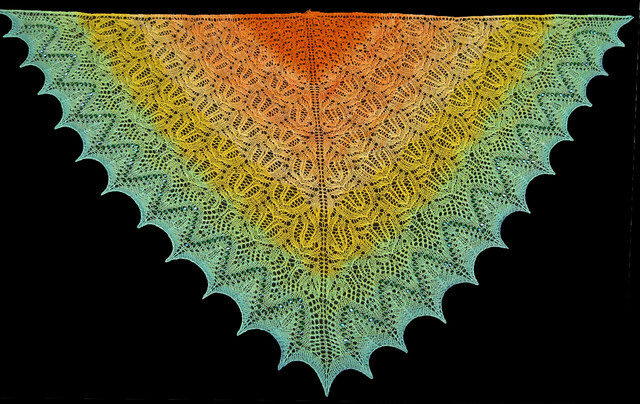 The top portion of the shawl is a little cat's paw design. 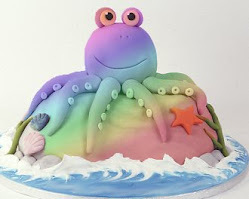 You can repeat this motif as long as you like. The pattern then segues into Frost Flowers, which some people don't like to work because it's patterned on both knit and purl rows. 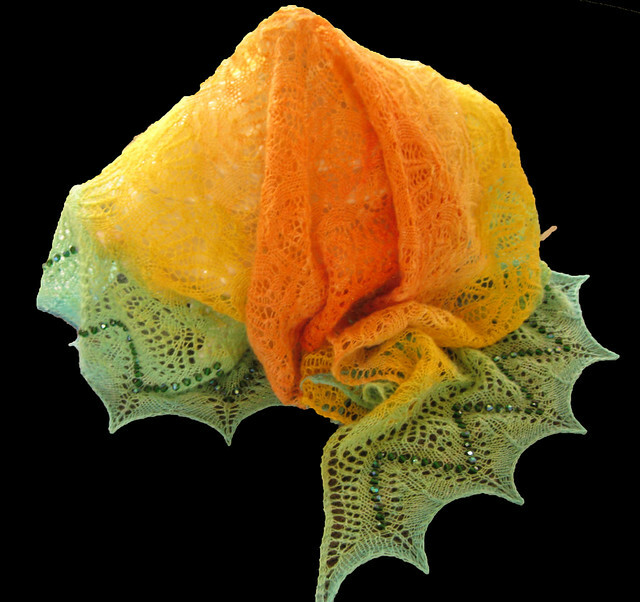 I confess I enjoyed knitting these--they look so lacy and delicate. 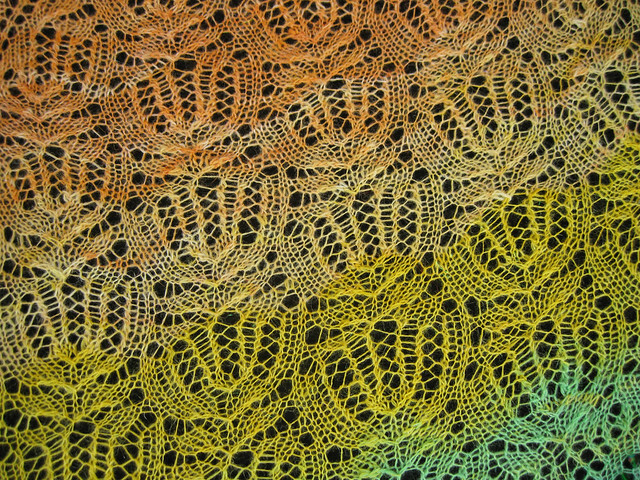 Note to Self: When calculating the required number of beads on one-half of a symmetrical shawl, don't forget to multiply by two, or you will have to sit around for another ten days waiting for the rest of the beads to arrive. 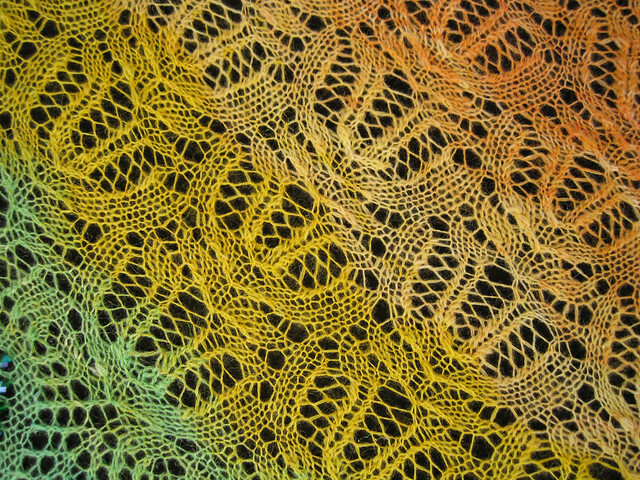 The yarn was one continuous strand--I didn't have to break the yarn to make the colors work. 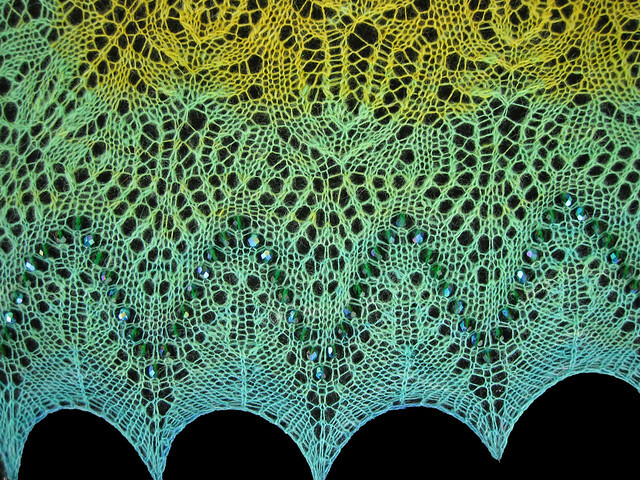 I just kept knitting the Frost Flowers pattern until I was into the greens and then proceeded on to the border. I did stop the Frost Flowers pattern in the middle of a repeat and just decreased away the extra stitches. I fully intend to knit this pattern again, making it a bit smaller next time for a little scarf that will tuck gracefully into a winter coat.